Nearly six years have passed since Microsoft began opening retail outlets patterned after Apple's blockbuster retail locations. 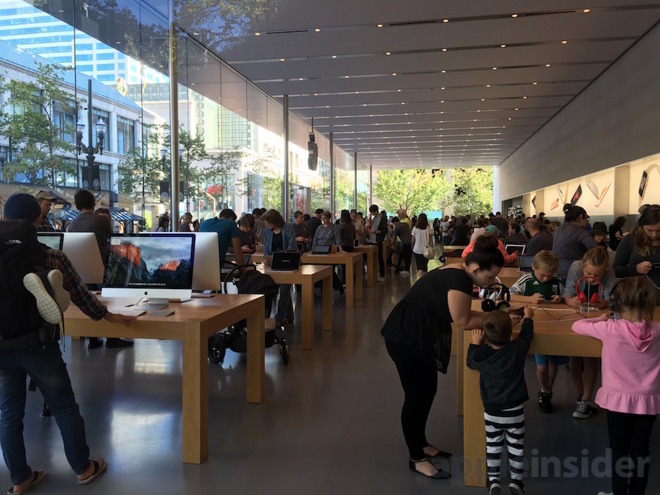 However, the now 116 Microsoft Stores are still a pale imitation to Apple's own retail network of 460 locations, often featuring more employees than customers as the firm's products have failed to excite and attract buyers. 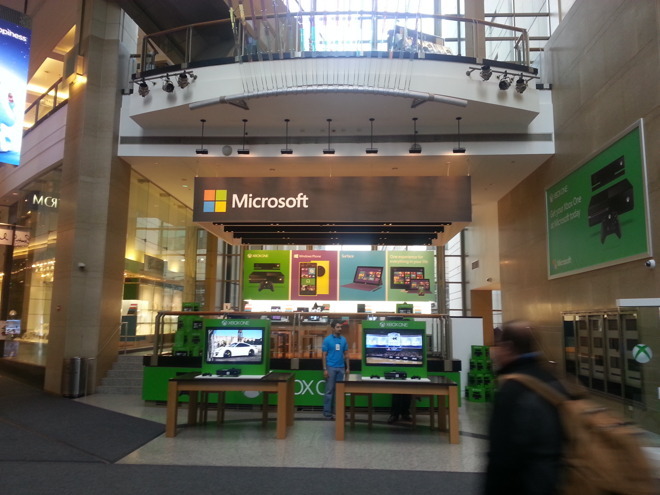 Microsoft opened its first retail chain outlets about 8 years and six months after Apple introduced its first stores. Back in 2001, the first Apple Store retail outlets were met with predictions of doom, largely due to the ongoing failure of retail stores run by PC makers ranging from Palm to Sony to Gateway. 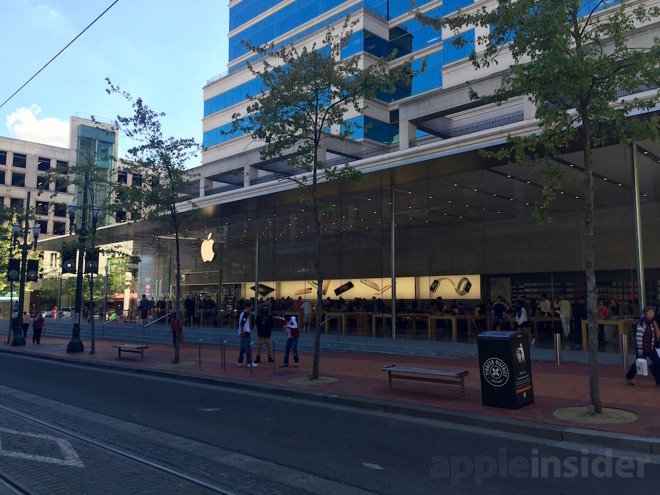 However, the first Apple Stores achieved profitability almost immediately, and subsequently played a major role in helping to launch new products ranging from iPods to iPhone and iPad over the next decade. 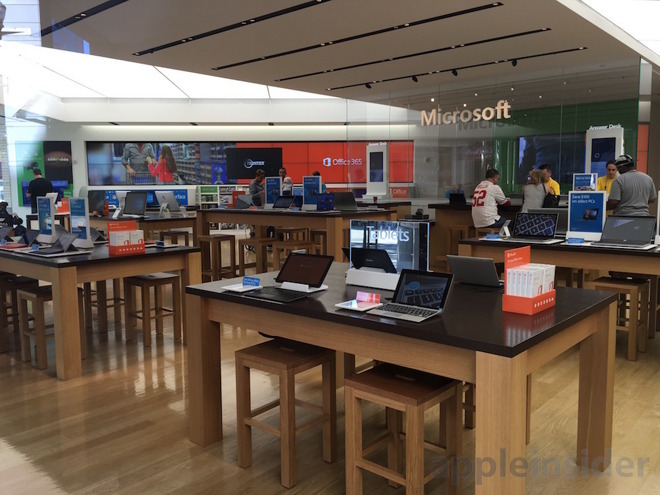 Microsoft hoped to emulate Apple's success with stores featuring virtually identical layouts, display furniture and features such as its own version of the "Apple Store Genius Bar," but has never really attracted the same kind of excitement. In part, Microsoft Stores have been hobbled by the fact that they initially served as a place to buy other maker's Windows PCs, products that can in many cases be obtained for cheaper elsewhere. Microsoft has also failed to introduce new products of its own to drive retail sales, instead releasing a series of duds including the Zune, Windows Phone and Windows 7 and 8. Even efforts to pay customers to bring in their used iPads and MacBook Airs an exchange for a Microsoft hybrid product have fallen flat. 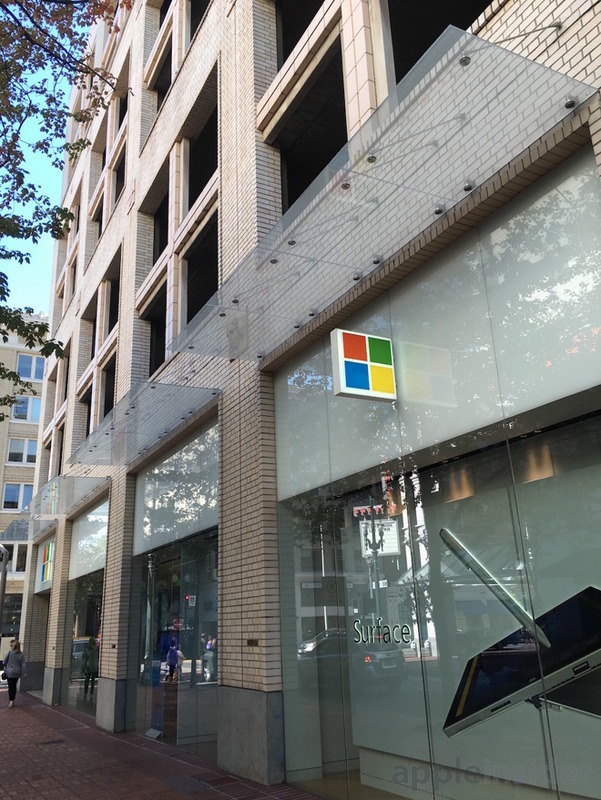 The San Francisco Microsoft Store is located in a high traffic mall near Apple's own flagship Union Square store just across Market Street, but while the Apple Store is usually always packed with shoppers and customers seeking assistance with their products, Microsoft's store typically has only a few shoppers at a time, and a significant proportion seem to only be there to play on a display Xbox. That was the case even over the holiday season last year, when San Francisco's Microsoft Store remained largely empty alongside equally dismal popup retail locations for Samsung Galaxy products and Amazon's beleaguered Fire lineup. 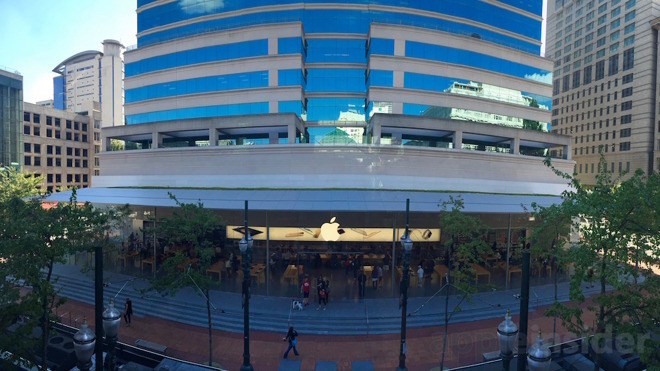 A similarly stark contrast can be observed in Portland, Oregon, where Apple recently moved its store from its original location inside an indoor mall downtown to an adjacent spot on the street, at the crossroads of two light rail lines and a block from the popular Pioneer Square. 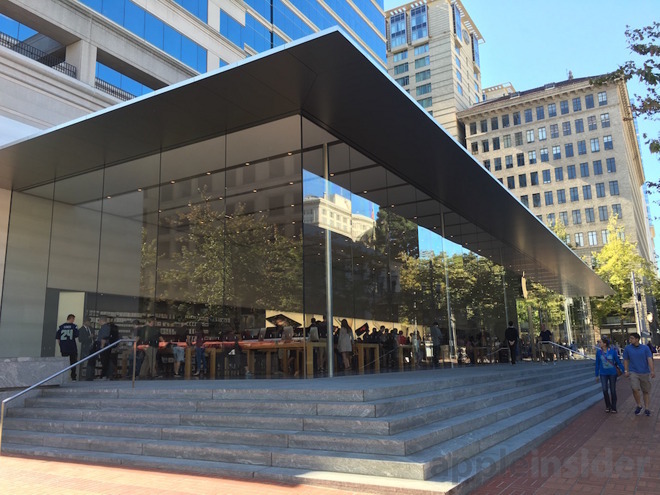 The new Portland Apple Store, similar to locations in Stanford, California, Omotesando, Japan and Aix-en-Provence, France, features a dramatic glass wrap-around wall suspended below a minimalist ceiling, which itself is covered by a green roof of plants. The large Pioneer Square store appears to be packed at all times, with virtually no unused space at any of the series of display tables most of the time. Just a block away, a Microsoft Store under the adjacent parking garage was built shortly before Apple's new store was finished, but it sits virtually empty, with more employees than customers. Similar looking tables sit vacant and nobody was even playing on the Xbox. The operational costs of leaving Microsoft Stores open must be enormous, but the company doesn't detail its retail operations in its financial reports, preferring instead to lump the retain chain into its "Device & Consumer Other" category that also includes everything from its video game studios to Bing search and display advertising to consumer Office software sales and online software sales. After 13 years of reporting its retail operations in detail, Apple announced a shift for fiscal 2015 (which began the last calendar quarter of 2014) that moved retail sales from its stores into geographical segments instead. At the time, the company explained that "management believes collaboration across its online, Retail and indirect channels is integral to better serve its customers and optimize its financial results," adding, "The Company's reportable operating segments will consist of the Americas, Europe, Greater China, Japan and Rest of Asia Pacific operations, and the Retail segment will no longer be classified as a separate reportable segment." This will serve to obscure the results of operational changes made under Apple's new head retail executive Angela Ahrendts, while offering less operational information to its retail competitors, most of whom--like Microsoft--already refuse to disclose any information about how much they are spending to keep their stores open. In parallel, Apple also stated last year that it wouldn't be breaking out revenue, profit and unit sales for segments including Apple Watch and iPods, and Apple Pay, which will be included in "Services" alongside iTunes, software and other services.